How do you make sure your device remains safe and effective once it’s on the market? 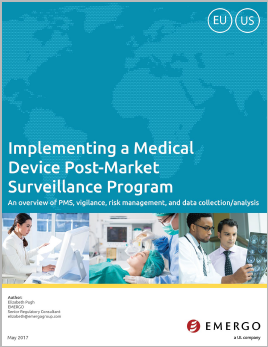 It’s called medical post-market surveillance (PMS), a system that provides continuous feedback about a device on the market in order to maintain a high standard of product quality. PMS is a regulatory requirement in major markets like Europe and United States. What is the difference between PMS and vigilance? What are the key elements of a PMS system? How should a PMS system function? What is the role of risk management in PMS? How do I implement data collection and review procedures? How does a PMS system benefit my company? We answer all of these questions and many more in this white paper. Elizabeth Pugh: Elizabeth Pugh is a Regulatory Affairs Consultant at Emergo. She has over 15 years of experience with regulatory affairs in the medical devices industry, and previously held positions at Stryker, FoxHollow Technologies, and DJO Surgical. Her areas of expertise include CE Marking compliance, post-market surveillance, and global vigilance reporting.